This image of the Apollo 17 night launch is dedicated to a long time friend of our pioneer astronauts, Jim Rathman. Jim owned a South Florida automobile dealership and was the supplier of the Corvettes that so many of our pioneer astronauts were fond of driving. In addition to being a major supporter of the manned space program, Jim was a champion race car driver (suggest you Google for his history. This image has been inscribed, "To Jim Rathman: Your interest and enthusiam in our nation's space program will never be fortgotten. 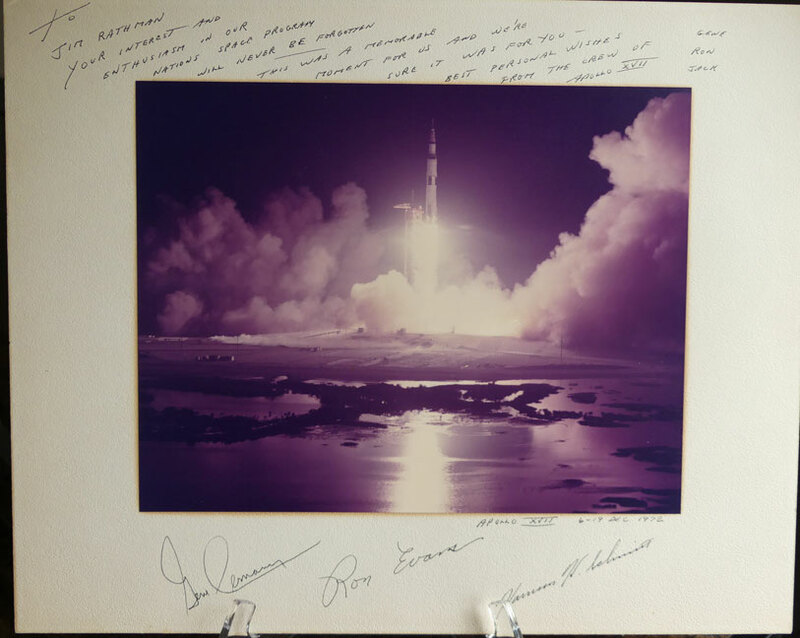 This was a memorable moment for us and we're sure it was for you - Best personal wishes from the crew of Apollo XVII....Gene, Ron, Jack". 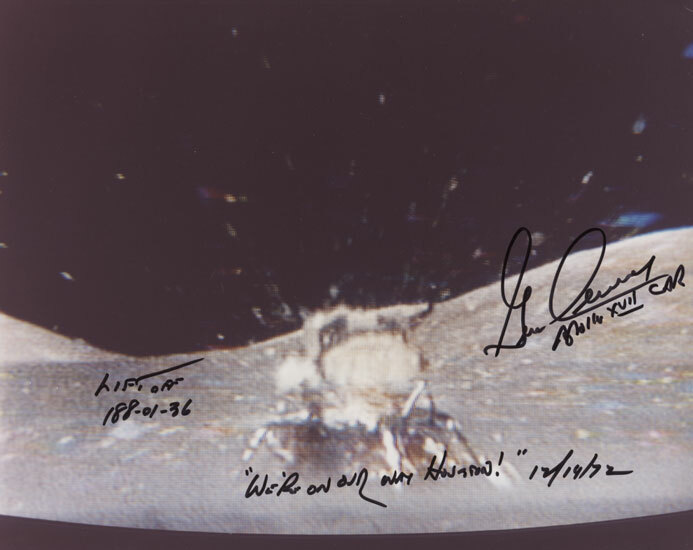 In addition, under the photo is written, "Apollo XVII 6-19 Dec 1972" and also signed on bottom of the mat. 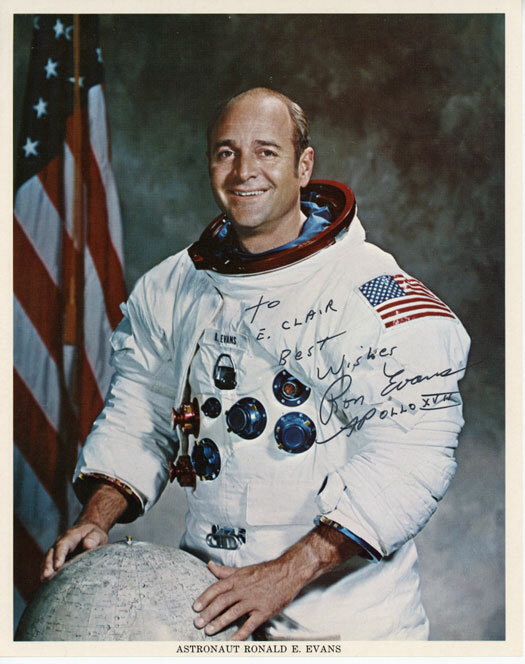 This is a very special signed image from a grateful flight crew to a well known figure who was closely associated with many astronauts in a most personal way. Mat measures 16" x 20" and photo measures 11" x 14". This magnificent image of Gene standing beside the lunar rover says it all. 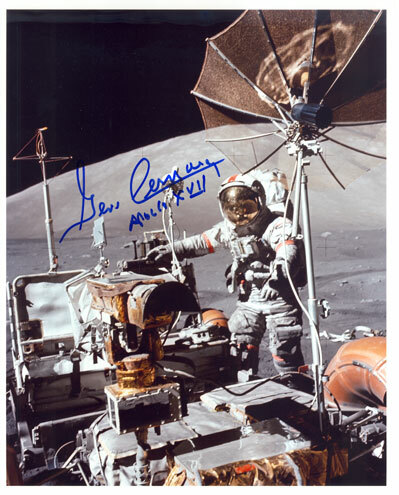 It is boldly hand signed in gold paint pen by Cernan who adds "Last Man On The Moon" as well as mission information. Measures 8x10. 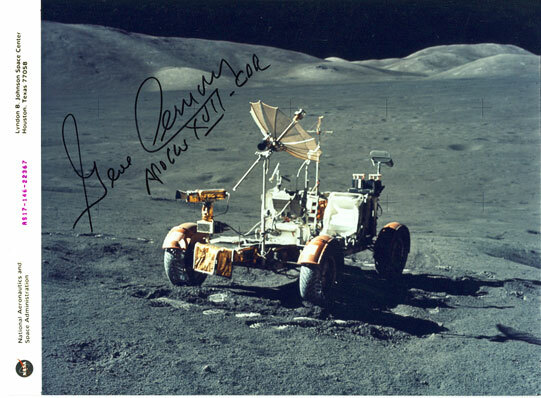 This awesome image Gene standing by the Lunar Rover is hand signed and inscribed with, "From the Moon !" as well as mission information added. This is an official NASA press release photo with the usual info on it's reverse. In beautiful condition. This photo measures 8" x 10.5". Signed in bold blue sharpie. 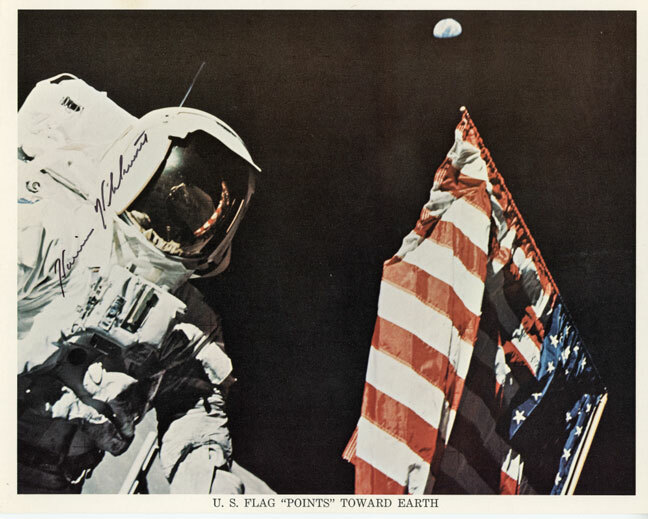 The classic image of Gene Cernan on the lunar surface with the American Flag and that marble called Earth over his shoulder. Signed in silver paint pen. Gene adds Apollo XVII. Pristine. 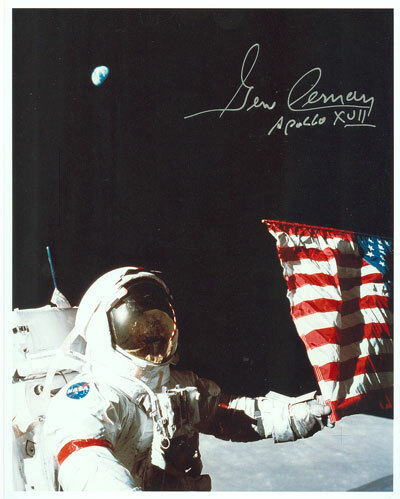 An official NASA "Meatball" press release photo of Gene saluting the flag with a wonderful inscription, "For you the sky is not the limit..." It is hand signed in silver paint pen with mission information added. This photo measures 8" x 11" with usual NASA info on reverse. This is a great shot of the Apollo 17 Saturn V on the pad poised for launch. It measures 8" x 10" and is beautifully hand signed by Gene in large bold silver sharpie with outstanding contrast to the image. Pristine condition. Amazing image of Apollo 17 night launch. 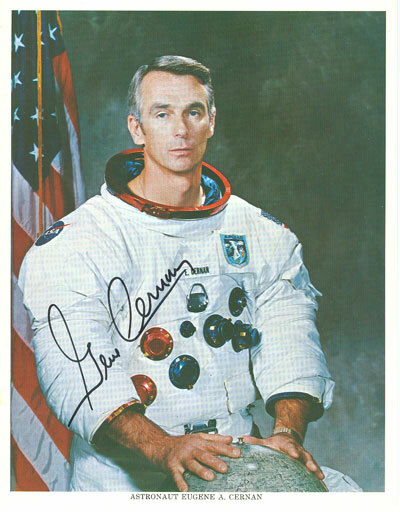 Hand signed in black sharpie by Gene Cernan who adds mission information. 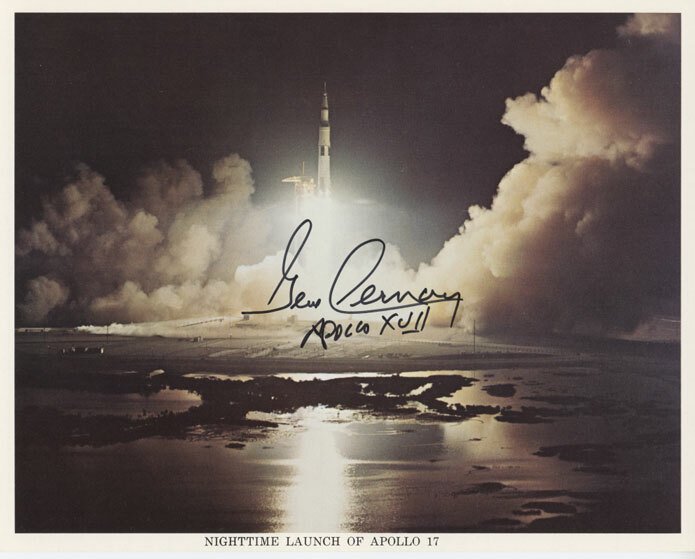 Same image as abive of the Apollo 17 night launch but this one is on an official vintage NASA litho. 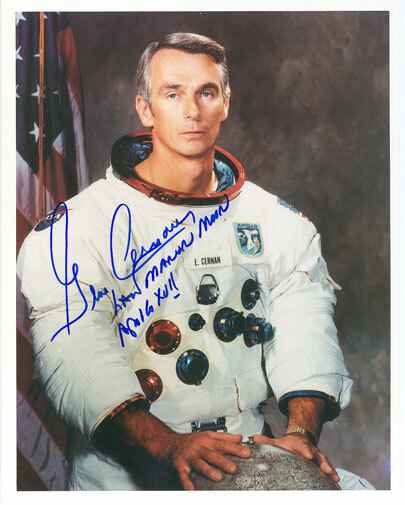 Hand signed in black sharpie by Gene Cernan who adds mission information. Measures 8"x10" and is in perfect condition. Official very vintage NASA litho showing view of landing site from CM. Gene has hand signed using black sharpie, Pristine condition." Amazing image of Gene working by the Rover. Hand signed in blue sharpie with mission information added. 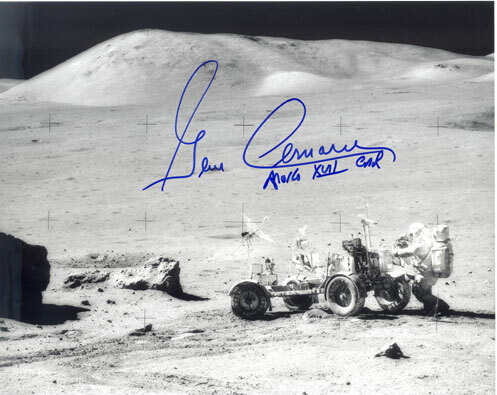 This awesome image of the Apollo 17 Lunar Rover with Gene Cernan by it's side is boldly hand signed by Cernan who adds mission information. Signed in gold paint pen, Measures 8x10. This is one of my favorite black and white images from this mission. Gene is seen standing behind the lunar rover. The reflection of the sun and the deep shadows make the overall feel simply haunting. A picture speaks a thousand words. Measures 8"x10" and is signed in bold blue sharpie with mission information added. It just doesn't get any better. 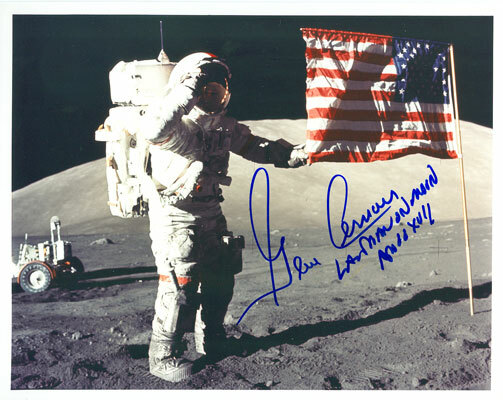 Great image of Gene Cernan's John Wayne pose, neatly hand signed in black. Awesome condition. Measures 10" x 8". 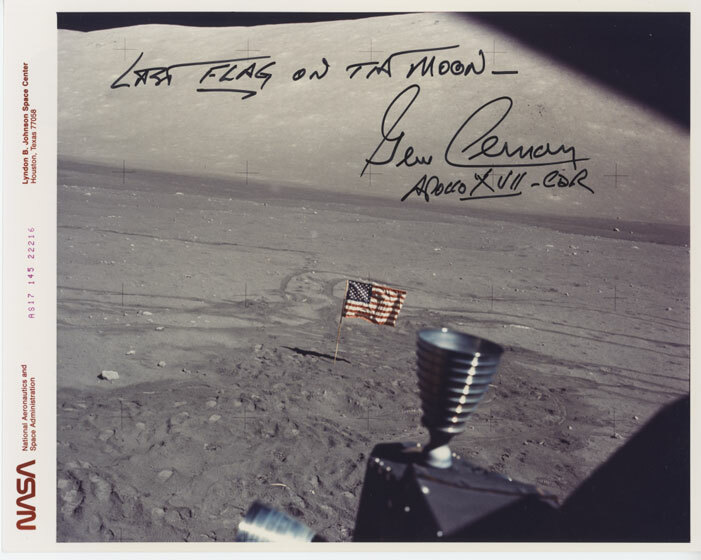 Gene Cernan saluting the flag, hand signs in bold blue sharpie and adds, "Last man on moon" along with mission information. This image measures 8"x10" and is pristine condition. Great image of Challenger lifting off on the lunar surface on December 14th, 1972 following the successful conclusion of the crew's three lunar EVA's. This image was taken from the rover mounted camera at the very moment of lift off at 100-10-36 elapsed time. 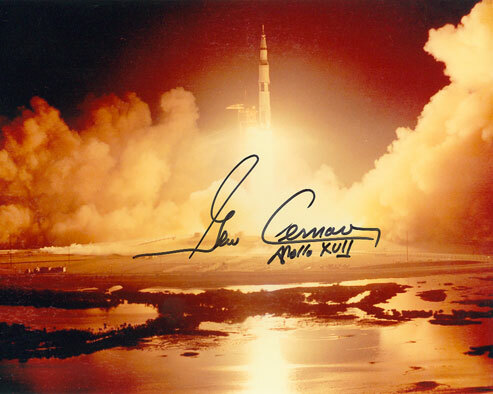 Captain Cernan inscribes accordingly and writes, "Lift Off, 188-01-36" and adds, "We're on our way Houston!...12/14/72" which were the actual words he used at that moment. 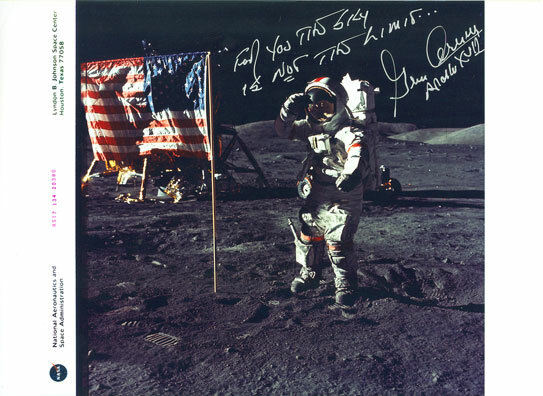 This is an amazing signed image and inscription. Measures 8"x10" and is signed in black sharpie. A great inscription on a most interesting photo. This Gene's classic white space suit portrait on an 8"x10" glossy photo. Gene has added "Last man on moon" and adds mission information. Pristine condition. 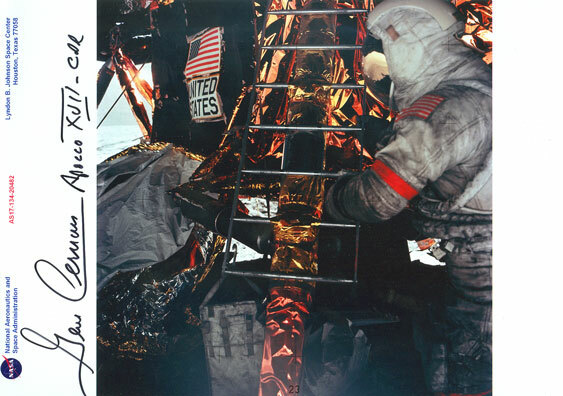 This Gene's classic white space suit official NASA litho. It measures 8x10 and has been signed in bold black sharpie. In beautiful condition with only thing worth mentioning being a 1.75" piece of clear tape on the reverse side that seems to have served no purpose that I can think of. 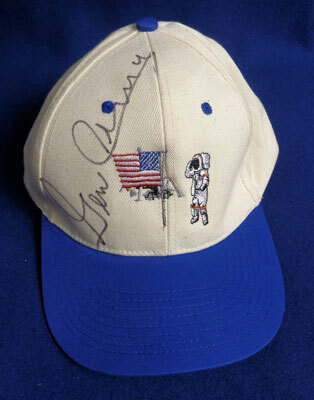 A VERY nice vintage hand signed NASA space suit portrait! 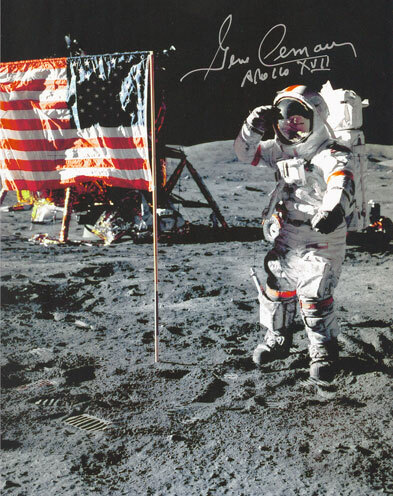 This vertically cropped image of Gene Cernan saluting the flag on the lunar surface is hand signed in silver paint pen with mission information added. Measures 8" x 10" and is pristine condition. One more outstanding black and white image shows Gene working behind the Rover. An amazing detailed image photographed by Harrison Schmitt. Hand signed in blue sharpie with mission information added. Note scanning flaw in upper left of image. Photo itself is absolutely perfect. 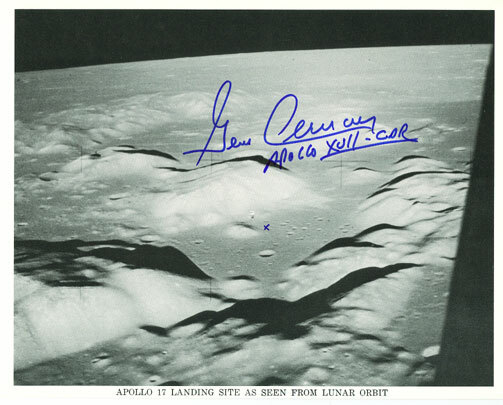 This 11"x14" image of Gene saluting on the lunar surface is neatly hand signed in black sharpie on the bottom right just under his image. 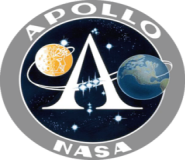 Gene adds "Apollo XVII". The matt itself measures 16" x 20". 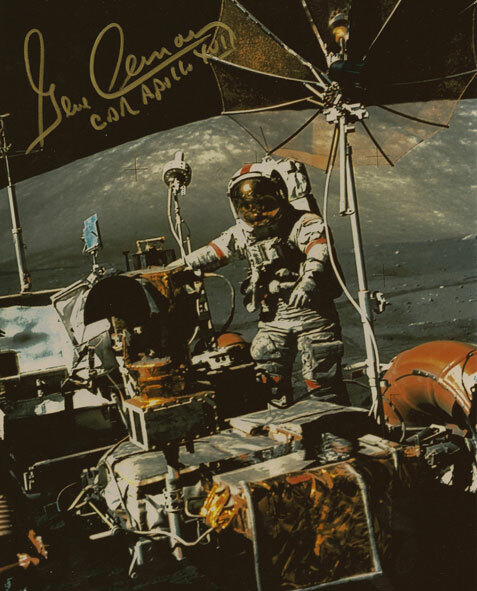 3"x6" heavy card stock hand signed by Eugene Cernan who adds mission information. Signed big and bold. Would be perfect mounted underneath a photo of Gene on the lunar surface. In pristine condition. 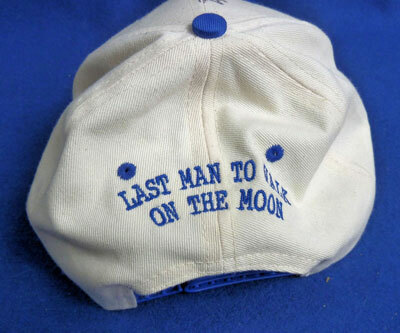 Baseball style cap produced in conjunction with Gene Cernan's signing tour for Last Man On the Moon. This baseball style hat has not been worn and is in "as new" condition. 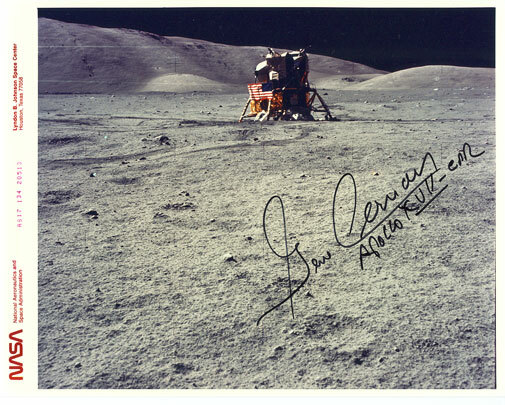 It is boldly hand signed in sharpie by Gene Cernan. Most unusual. 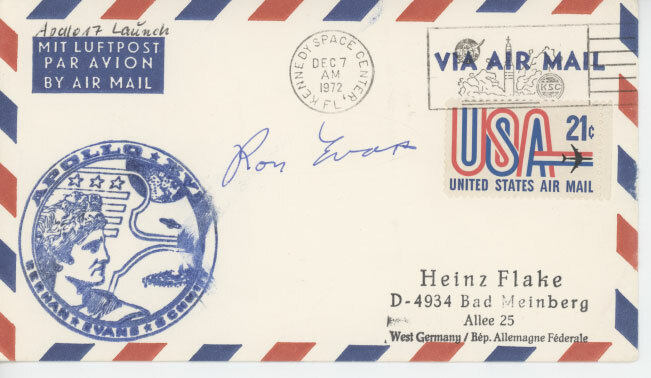 Ron Evans letter TWICE signed on NASA stationary, dated 5/25/76. He is writing to a fan regarding an autograph request and in addition to the text, adds seven additional hand written lines. A great vintage letter written as "Captain, USN & NASA Astronaut. 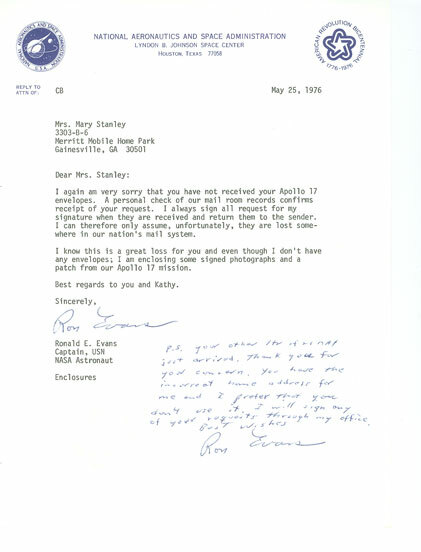 Ron Evans letter written entirely n his hand in responding to someone inquiring about a list of reference materials. 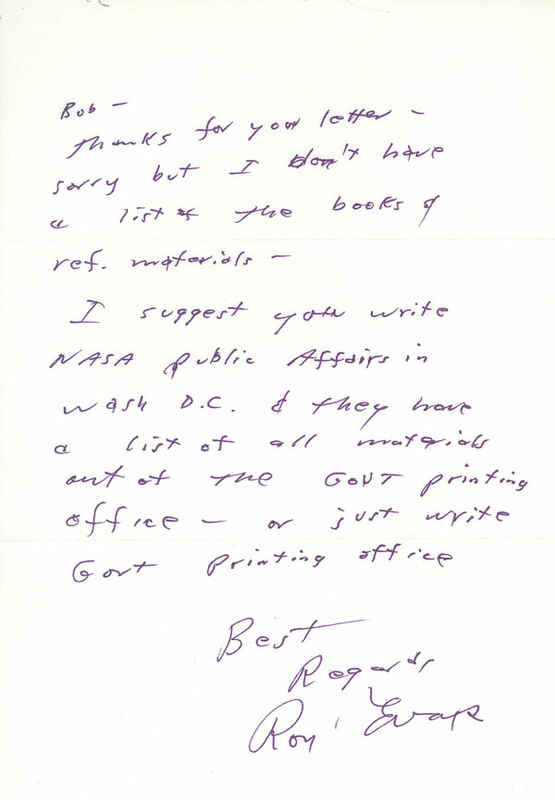 Evans refers him to the NASA public Affairs Office in Washington, DC. This hand written letter fills an 8.5" x 6" nch page. It is in great shape with the usual fold lines. Envelope not available. 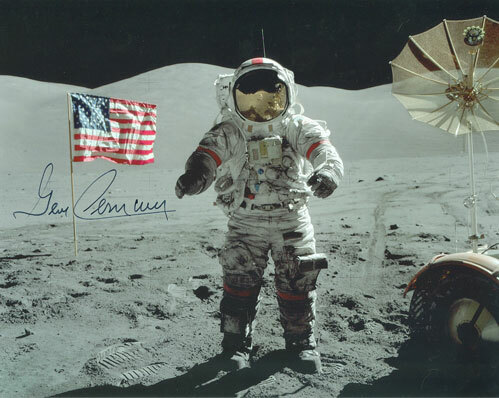 Ron Evans hand signed and inscribed Apollo 17 space suit portrait. This official NASA litho is in wonderful condition. Measures 8x10. Ron Evans hand signed cover. Cancelled on Apollo 17 launch date of 12/7/1972 at KSC, FL. Very nice and in great shape. 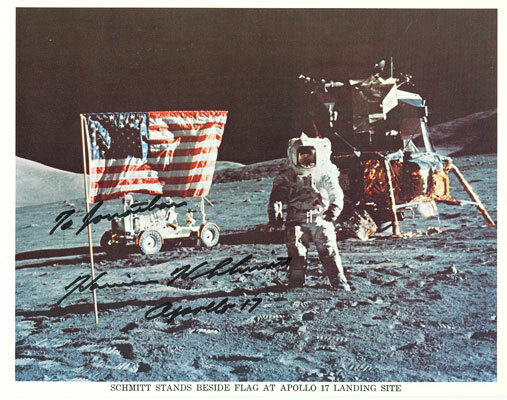 This vintage NASA litho shows Schmitt on the moon and is hand signed, "To ....., Harrison H. Schmitt, Apollo 17". This is a sample. A few inscribed to different first names are available. It is in superb condition. Measures 8"x10". 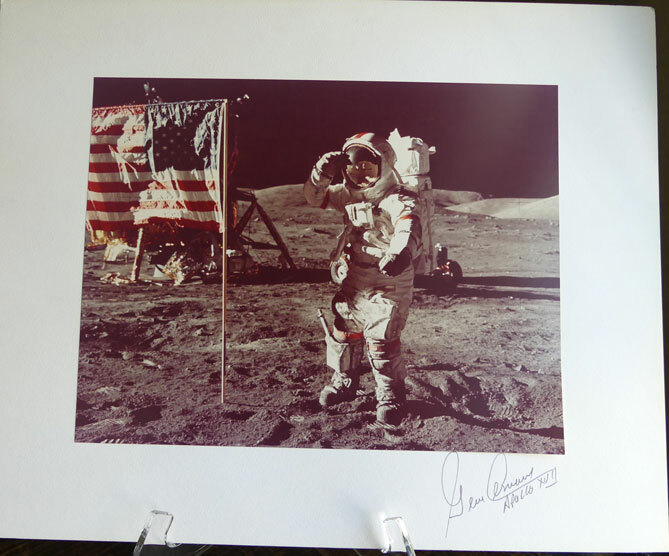 This vintage NASA litho shows Schmitt on the moon and is hand signed in black sharpie, "Jack Schmitt". It is in superb condition. Measures 8"x10". 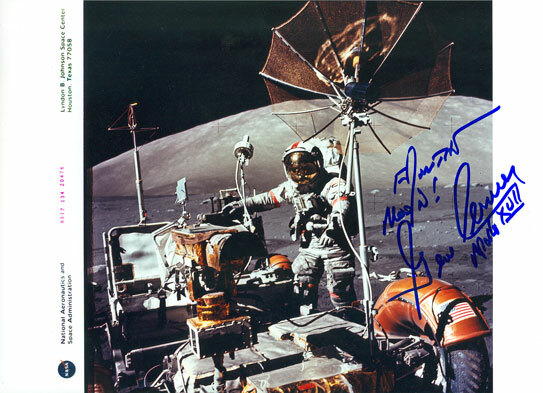 This vintage NASA litho shows Schmitt on the moon and is hand signed in black sharpie, "To Jorge and the future! 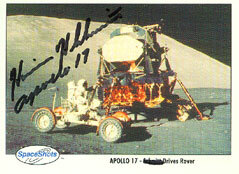 Harrison H. Schmitt, Apollo 17". Not as often seen as other Schmitt surface lithos. It is in superb condition. Measures 8"x10". Index weight card stock measuring 3" x 5" beautifully and boldly hand signed in black sharpie by Arrison Schmitt. If you're looking for a signed index card, it doesn't get any better than this. 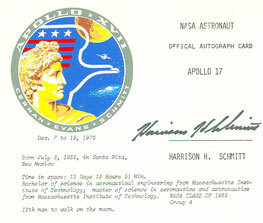 8x10 NASA vintage litho NOT personalized and hand signed in black sharpie, "Harrision H. Schmitt" Outstanding condition. Measures 8x10". 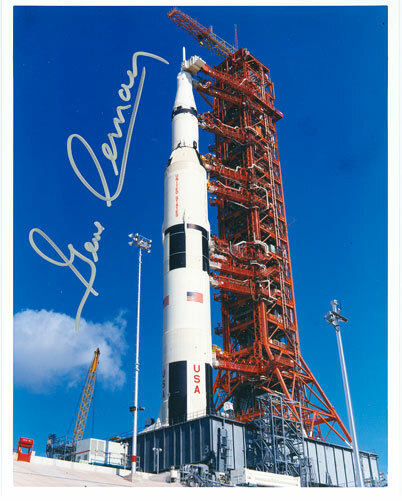 8x10 NASA vintage litho ISP ("To Dan"). Signed in black sharpie. This one is JSA certified. Outstanding condition. 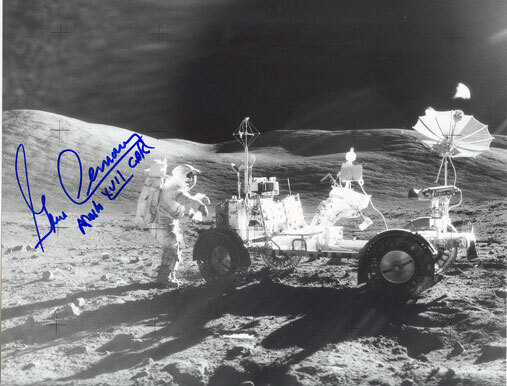 This Harrison Schmitt hand signed vintage NASA litho is the most highly sought after and perhaps most difficult to find (in this state) of all Schmitt signed images. 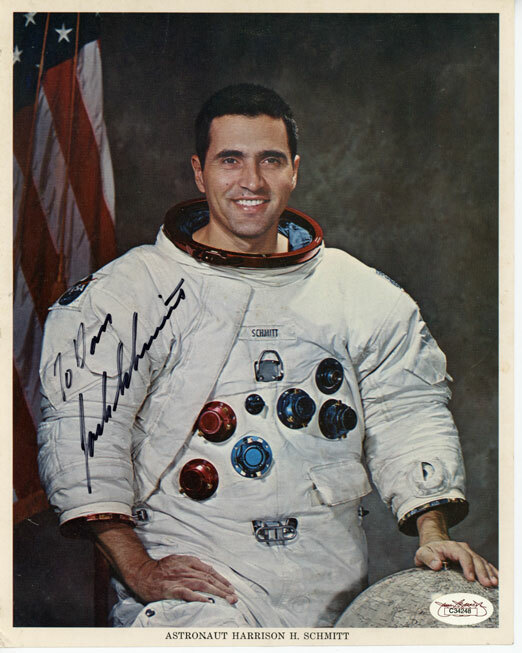 This one is signed "Harrison H. Schmitt" in black sharpie and measures 8x10" with NASA info printed on reverse. In pristine condition. 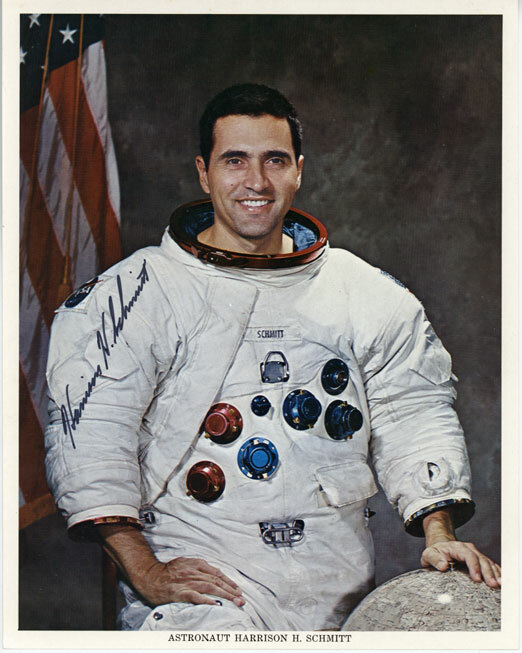 This Space Shots card (#0173) measuring 2.5"x3.5" is the Holy Grail of Harrison Schmitt images. It is hand signed by Schmitt in bold black sharpie. In beautiful condition. 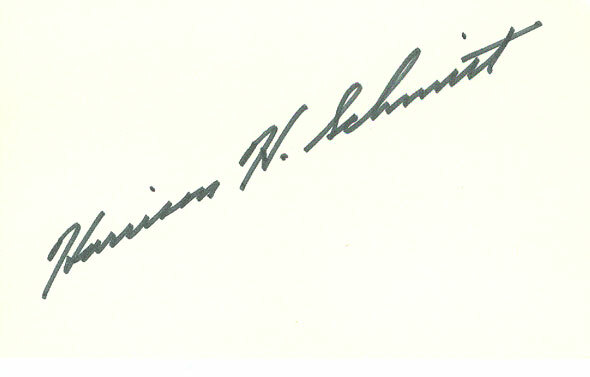 If you need Schmitt's signature on this image, consider this one. You can't go wrong and is unquestionably authentic. 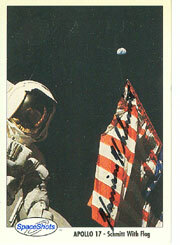 This Space Shots card (#0173) measuring 2.5"x3.5" is of Cernan in the Rover by their lunar module. 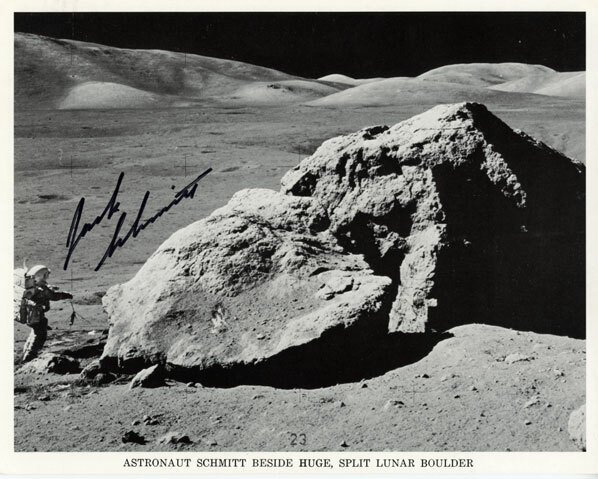 Schmitt signs boldly and adds mission information while also crossing out his name in the caption which was mistakenly used. Beautiful condition. 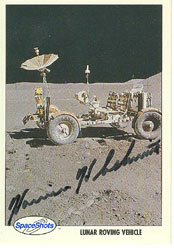 This Space Shots card (#0154) measuring 2.5"x3.5" is of the lunar roving vehicle used by Schmitt and Cernan throughout their mission. Schmitt signs boldly in black sharpie. Beautiful condition. 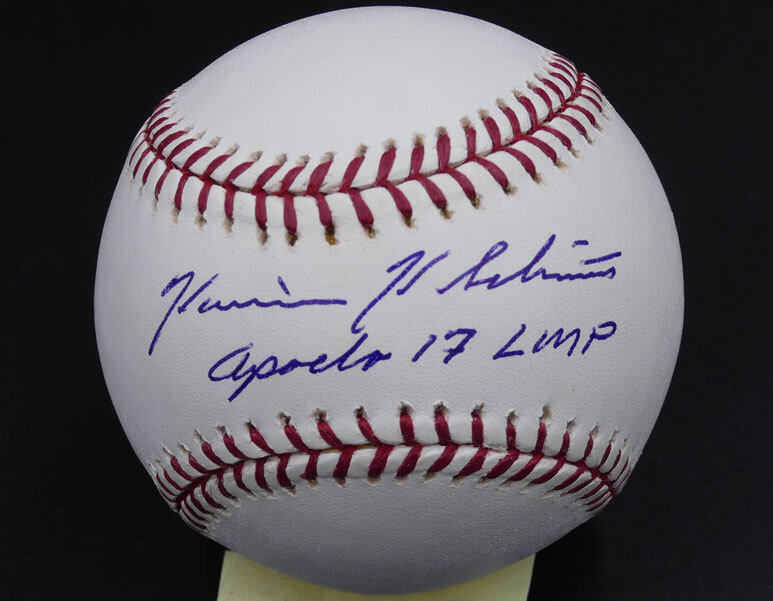 This baseball is beautifully hand signed in blue sharpie by Harrison Schmitt who also adds mission information. This couldn't be nicer and is something you'd be hard pressed to come by today given Schmitt's signing habits. 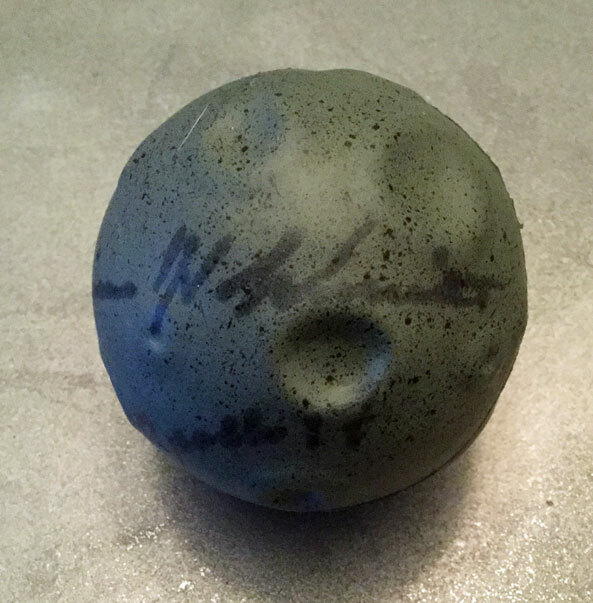 This most unique item is a rubber MOON ball. 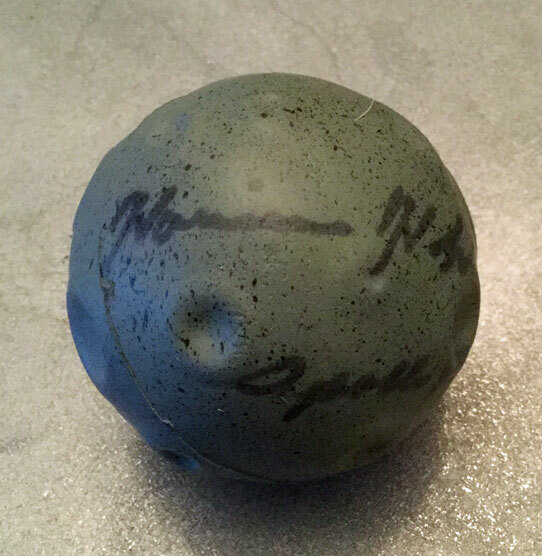 It is approximately 3" in diameter and includes craters. Making this really special however is that it has been hand signed in black sharpie by Apollo 17 Moonwalker Harrision Schmitt who also adds mission information. 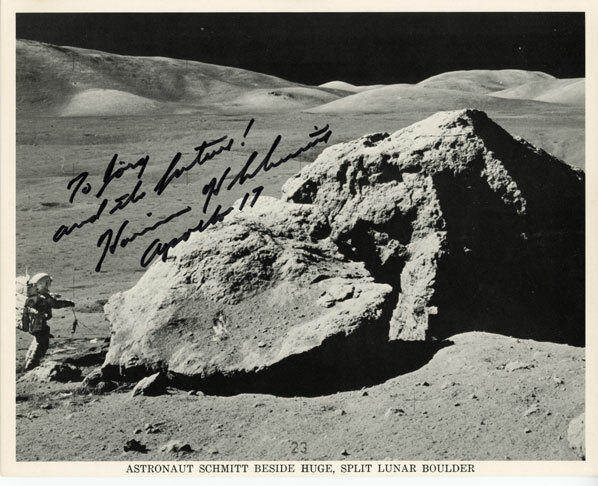 Schmitt's signature was provided specifically for Apollo 17 Flight Director Neil Hutchinson and from the time it was aquirred has been a part of his personal collection. It is in perfect conditon.